In 1976 the Norfolk Presbytery, recognizing the community growth in the Kempsville area of Virginia Beach, authorized the establishment of a new church. The Presbytery purchased the land at the intersection of Providence Road and Whitehurst Landing Road for the construction project and provided a grant in the amount of $125,000 to help get construction underway. The Rev. Carlyle A. McDonald was called as the organizing pastor. 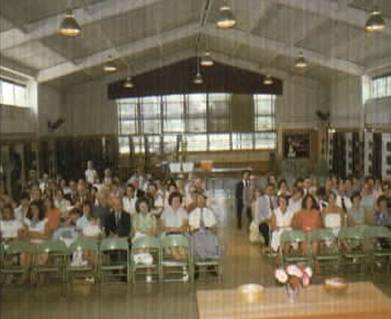 The first worship service was held at Woodstock Elementary School on June 5, 1977 with 98 people in attendance. The small congregation grew rapidly to 196 members at which time it was formally chartered as Providence Presbyterian Church on November 13, 1977. The church community continued to meet and worship in Woodstock Elementary School for one year and then moved to Kempsville Junior High School where it remained for four years. During that time, Donald Reid, an elder in the church, assumed the responsibility of Project Director for church construction. A building committee was formed and took up the responsibility of general contractor. 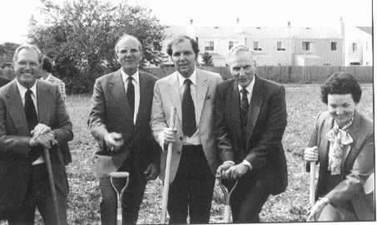 Church construction began with a ground breaking ceremony on October 4, 1981. Pictured above is the nucleus of the Church Buidling Committee: Charles A. Verget, A. James DeBellis, F. Donald Reid, James H. Lytle and Edith H. Hill. The building program was started in three stages: Stage one completed the Sanctuary, offices, kitchen, restrooms, nursery and classrooms. Stage two completed the building. Stage three added the Fellowship Hall onto the first building. Work began in February 1982 with the laying of the foundation and by June the external form of the building was essentially complete. The building makes use of Georgian architecture and has a 100-foot lighted steeple. Fink and Associates of Philadelphia designed the building along with Carlton Goodwin of Virginia Beach. The 2 and one-half ton, 57-foot tall steeple was made by Aluminum Fabricators of Campbellsville, KY and trucked to Virginia Beach. It was placed in June 1982 and, at the time of placement, was one on the tallest structures in the city rising to 100 feet. Rev. McDonald was hoisted up by construction crane to place the steeple cross. During and immediately after the construction, men and women of the congregation volunteered their time and talents to putting the finishing touches on the building project. Congregational volunteers worked hundreds of hours cleaning, doing carpentry, painting, installing hardware and floor tile, and grading and seeding to add the many nice housekeeping and landscape touches we still enjoy today. Everyone contributed. Even Pastor McDonald used his own talents in carpentry by designing and building the white, octagonal pulpit for the church sanctuary. 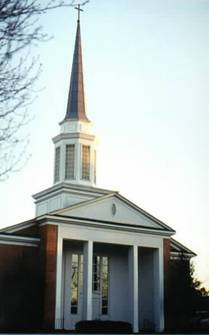 The first worship service was celebrated in the new church building on August 8, 1982. The Fifth Anniversary was a time of celebration as the newly built Church building had opened its doors barely three months prior. The Fifth Anniversary celebration took place on Sunday November 7, 1982. The day was marked with a formal Worship Service followed by an open house, and a tour of the building. The Twentieth Anniversary was celebrated on Sunday October 12, 1997 with a special Worship Service and dinner attended by all former pastors and many past members who had traveled from out of state. Rev. Larson, one of the early pastors of the Church, was invited to speak. He offered his insights and reminiscences marking the anniversary. Providence Presbyterian Church marked its twenty-fifth anniversary on November 10, 2002. We were honored by the presence of former pastors Rev. Carlyle McDonald and his wife Tony; Rev. Bob Larson and his wife Mary; Rev. Robin Wooddell and his wife Beverly; Rev. Charles Speight; and Rev. Richard Lund and his wife Barbara. Rev. Ken Hicks and his wife Tina were unable to attend the event. Morning worship was inspiring and the music uplifting. Rev. McDonald, our founding pastor, participated in the service with Rev. Bell. Rev. Bell, in his message, thanked the former pastors and their wives for laying the strong foundation on which Providence stands and for their hard work and diligence in serving this church. Numerous charter members and former members were in attendance. The anniversary weekend celebration began with a Golf outing on Friday and a catered barbecue for the entire congregation on Saturday. Celebrating thirty-five years as an organized church, Providence Presbyterian marked the occasion during its morning worship service on Sunday November 11, 2012. Charter members were called to the front of the sanctuary and were recognized during the service for their vision, faith, and support through the years. Afterwards, the entire congregation, family and friends celebrated with a pot luck luncheon in the Fellowship Hall. During lunch a special multimedia presentation chronicling the past thirty-five years was offered to document how far we have progressed as a church.